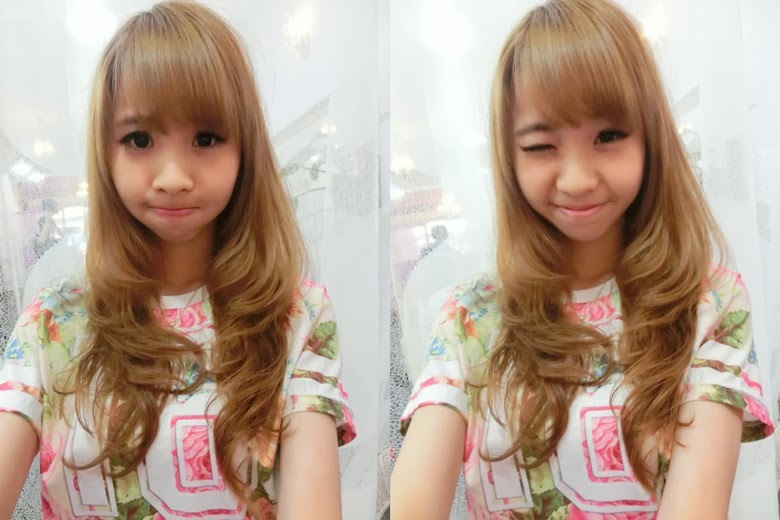 HELLO MY SWEETIES♥ :3 I'm seriously can't wait to update this blog because I wanna show you my recent hair transformation. 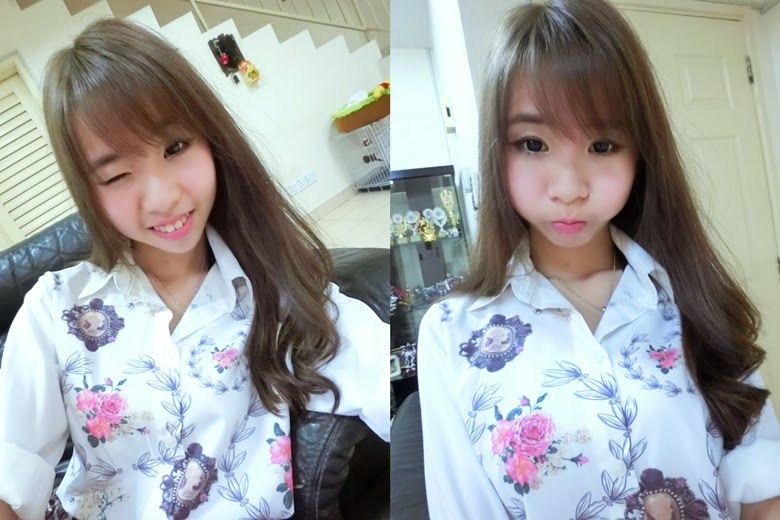 Probably if you realize I actually changed my hair style before and after I back from my Korea Trip. Remember my favourite salon and not to mention I already forgot how many time I actually went there to do my hair treatment and soon I'm going to try out their new hair scrub. I'm seriously really happy I found a suitable salon for myself. I tried so many diff salon near my house and you know I always complain they end up spoiled my hair. You know HAIR IS LIKE OUR BABY! Girls have a nice hair style really change our life. And I'm super happy I saw some of you really visited their salon because I'm always hope to share the happiness with you guys! Time passed my hair become so cacat , no layer , messy , tangled , faded after my working time plus I DIDN'T GO TO their salon for like 1month plus.. FINALLY I discuss and decided to paid a visit to Lilac Salon again. After the first time I went ..After all my hair all done by my personal magic hand hair stylist. I was kind of surprise their service actually super good especially they understand your needs and wants. Actually I keep asking whether I can perm my hair a not because you know I never 'die heart' and never give up to ask -.- I know everytime I had bad experience on it. Not all blame the hair stylist sometime it's because my hair structure not really good because those digital perm and normal perm previously suitable and recommended for those who have thicker hair and more rough. My hair is super thin + too fine! So everytime I perm my hair have no 'power' to create the curl and no matter how I perm the hair still can't stand strong. So the curly is become like spoiled curly wave hair. Then, the best decision I made. Bleach my hair to a lighter color so that I can have my lavender ash color. So you know I always take care of my hair but recently I really not afraid to cut my hair to shoulder length or even shorter so I say YES! Bleach baaaaa~ But I still worry because it will damage and make my hair dry. I know I'm sure you will ask me..Then chanwon why you still want to dye and bleach neh?! Sincerely, every chemical used and put on our hair definetaly have some % can damage your hair. Of course bleach will but since I decided to then I should bear with it . The reason why I get back my smooth hair and can perm again within just a month or 3 weeks+ time is because I did alot treatment on my hair. YES! Without any treatment I can say BYE BYE to my hair and you wont see me now! I probably hiding behind my chair and cry for like a month! until my hair grow longer! LOLLLLL If I'm busy I die die also will visit their salon once in a month because they have lots of nice treatment. Some people say treatment might not long lasting and it just look super smooth after you done at the salon and the next 2 days after you wash your hair ..your hair still remain the same?!!! Many people took photo like HOW SMOOTH is the treatment blablablabla is actually all treatment have the same function. (Look super nice and soft or smooth after that) You can't really get a smooth hair if you just did it one for whole year and continuous dye your hair like crazy. Other than baby pink I tell you I LOVE THIS TO THE MAX! Like very young and cool with this lavender ash color! Because I always tried brown or red never get a chance to try this color if I didn't bleach it. HAHAHAHA SO CUSTOMER VERY SATISFIED on that day! And of course super happy that this color stay with me until I back from my korea trip on oct. I can long lasting for 1 month + if you take care it nicely. This video prove to you that it's permanent because it actually curly hair one but when you blow & dry it will become like this. I can't believe that they success to curl my hair. You know it's like miracle especially for me because I just bleach my hair (normally after bleach it's not recommended) but really thanks lilac salon and their hairstylist group of taking care my hair. I remember that day 5 of them standing behind me and discussion what can and how to perm my hair. I'm very happy and super proud to become one of their blogger :) I KNOW,..AND SERIOUSLY KNOW not much people can perm what I want! You know I'm very choosy and not people understand me! It's not a long process probably 2 hours and 30 mins cutting my hair so that it can create this kind of curl. They actually only turn 2 times the curl from the bottom part of my hair so it didn't stick and touch my roots and all my create move from behind to in front of it. I don't know how to explain the procedure but of course only skilled hairstylist know it. I'm happy that this creep perm suit me alot and achieve what i want!! THANKS AND LOTSS OF LOVEEEEEEEEEEEEE for all of them!!! OH MY HAPPY FACE!!!! NICE MA NICE MA?!!!! I know some of you wonder how it look if without any blow & dry. I'm lazy also so I just let it dry automatic. This is how my hair look like if I didn't blow & dry it. I think it's still nice hor!!! This creep perm can last for 3-5 months depending on how you take care it. If you go salon every month or every 2 week of course your curl will hold longer than those who cincai cincai never take care it after perm. Now I know your next question. How much it cost? 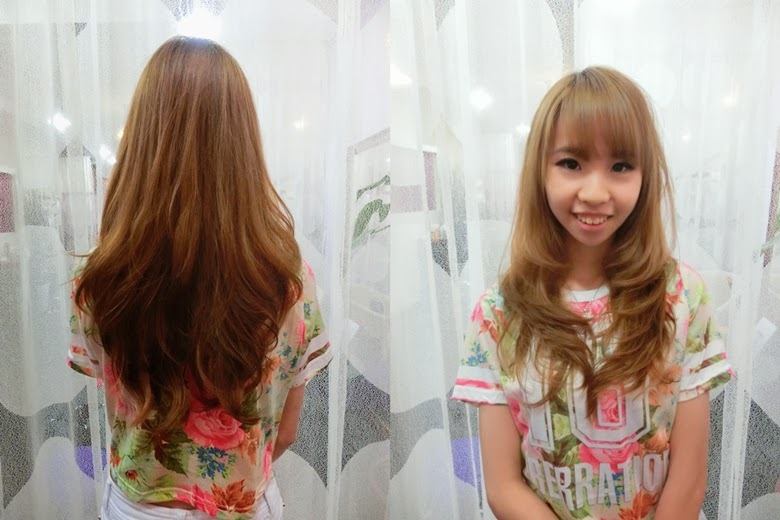 Creep Perm cost RM280 only!! Other than that you can call them and ask shinno for the price because sometime I received msg from some of you asking how much it cost for my hair. It's hard to answer since everyone have diff hair length , thickness and your base color. So it's important and will be nice if you can straight away ask the one who did your hair style. Don't be afraid to ask they wont bite you :P They are so friendly!! !